THE CITY OF SAINT Petersburg in RUSSIA is known throughout the world as one of the marvels of urban planning and magnificent architecture. As the capital of the Russian Empire from 1712 to 1918, the city was the staging ground for the dramatic events of Russian history, from Peter the Great’s forced introduction of Western (modern) customs in the early 18th century to the upheavals of the Bolshevik Revolution of 1917. Renamed Petrograd during World War I (to sound less German), then Leningrad in 1924 to honor the Soviet Union’s first leader, the city has once again returned to its original name (since 1991—actually, Sankt Peterburg, from the Dutch) and once again focused itself leaning Westward in an effort to reclaim its position as a leading center for European culture. The year 2003 saw the city celebrate its 300th anniversary with exhibitions, major building renovations, and religious and civic festivals throughout the year. Saint Petersburg is Russia’s second largest city, with over 4.7 million people living in its borders. Located 400 mi (650 km) from MOSCOW, Saint Petersburg presents itself as a second capital for Russia: while Moscow is very much at the center of Russia, with train lines emanating in all directions, Petersburg is located on the far western fringe, on an outlet to the sea, within close proximity to other European capitals in the Baltic. It was this very position, at the head of the Gulf of Finland, that led Peter the Great to undertake the massive project of building this city in the first place, his great “window on the West,” starting in 1703. The area where the Neva River flows into the gulf had only recently been taken in war against the Swedes but consisted of nothing but marshland and the remains of the fortresses of Nyen and Nöteborg. As part of his program to reform Imperial Russia by looking toward the political and cultural world of Western Europe, Peter ordered a city to be built from scratch, sparing no expense, and hiring the finest German engineers to drain the swamps and the best Italian architects to design its buildings. His passion resulted in a beautiful city, at the expense of the lives of thousands of peasant laborers. The plan drawn up by the French architect J.B. Leblond called for broad avenues and huge squares and became one of the models of urban planning for the 18th century. Because the city was built on drained swamps and numerous small islands (44 altogether), it retains hundreds of streams and canals and over 500 bridges, earning the nickname “the Venice of the North.” Huge buildings were constructed from stone, in the latest classical and Baroque styles. The most famous of these include the Peter and Paul Fortress, Saint Isaac’s Cathedral, the Winter Palace, and the Hermitage. Nobles from across Russia were relocated to the new capital, where they built grand palaces in the city, lining the canals and grand boulevards—foremost among these is the Nevsky Prospekt (2.8 mi or 4.5 km), stretching from the Admiralty to the Monastery of Alexander Nevsky. Equally grand estates dotted the surrounding countryside, many of which continue to draw in tourists by the thousands each year: palaces like Peterhof and Tsarskoye Selo. The center of the city has recently been designated a United Nations World Heritage Site and particularly draws tourists during May and June, the time for its world-famous White Nights, when the night sky never fully darkens. Saint Petersburg saw most of the firsts in 18th- and 19th-century Russian history: the first academy of science, the first Russian opera, the first permanent theater, and the first segment of railway in Russia, stretching 16 mi (26 km) to the suburb of Pavlovsk in 1838. As capital of the empire, it was also the site of political aggression: the Decembrist uprising of 1825; the Bloody Sunday massacre of 1905; the murder of Rasputin in 1916; and the March and October Revolutions of 1917. During the Soviet era, Leningrad suffered from one of the most famous sieges of the 20th century, withstanding the Nazi onslaught for over two years—the 900 Days, from September 1941 to January 1944—with no outside supplies except those dropped by airlift or from trucks crossing the frozen Lake Ladoga (the famous Doroga zhizni, “Road of Life”). The modern city’s location is still its primary advantage. 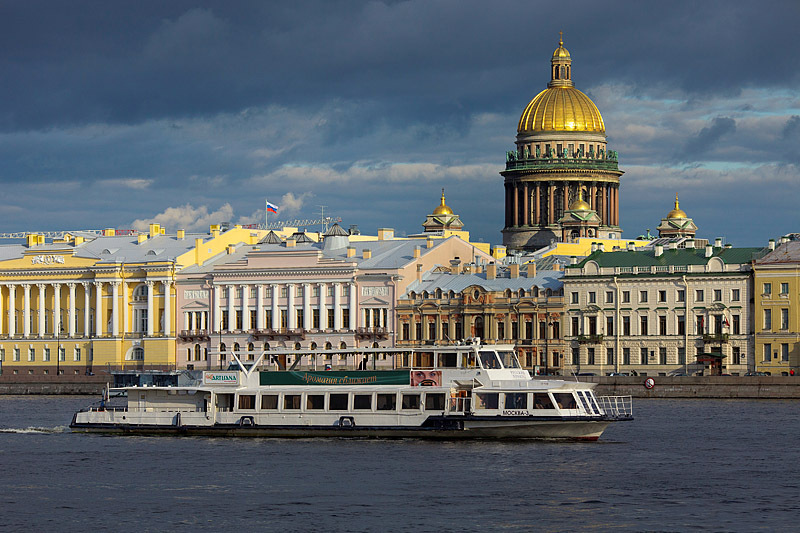 Traffic from the Baltic passes through Saint Petersburg up the Neva River, which connects to both Lake Ladoga and Lake Onega. From these lakes, the 19th-century Mari Canal leads to the VOLGA RIVER headwaters and therefore into the heart of Russia and beyond, as far as the CASPIAN SEA (the Volgo-Baltic Waterway). Another canal, the Baltic-White Sea Canal, was built by the Soviets to further link the city with Arctic shipping and northern ports like Arkhangel’sk. Rail links bring in grain and coal from the south as well as timber and minerals from the north, which are then exported to markets in the west. The coastal climate keeps Saint Petersburg slightly warmer in the winter than Moscow; nevertheless, ice from December to April limits shipping to narrow channels cut with ice-breakers. Having limited resources of its own (some sand and gravel quarries and large amounts of peat), the city was dependent throughout both the Imperial and Soviet eras on the Baltic states (ESTONIA, LATVIA, and LITHUANIA) for most of its food and fuel. These two factors lie behind much of the anxiety felt by Russians, and particularly Petersburgers, toward the ever increasing independence of the Baltic states, and particularly the loss of the Kaliningrad enclave (where the deep water does not freeze). But Saint Petersburg’s regeneration as a European city is spurred by an increase in western exports of steel and electronics, supplemented by solid growth in tourism.